There comes a time in a man’s life (and a woman’s too, lest we be accused of sexism) when his body can’t quite do what it used to be able to do. Your body becomes slower to recover from a game, with increasingly familiar aches and pains haunting the bones and the muscles a bit longer each time. Slowly, age creeps up on you until one day it jumps right out in front of you. Like the heinous face of a horror movie character staring at you in your bathroom mirror, it’s quite possibly going to scare the crap out if you. And you know what the worst part is? You’ll realise it has been lurking there for a while, but you’ve just been avoiding making eye contact. You’ll start to notice things. That burst of pace – it’s gone. That strength to hold off the defender – slowly fading. The ability to go out for a few drinks after a game and still be ok for work the next day – embarrassingly disappeared. If you’re starting to think like that, you need a dose of perspective. You’ve just realised that you’re not as young as you used to be, but it’s not as if somebody has just switched off your life support. Oh no, you’re far from on the heap. In fact, that’s why we decided to write this article – to give you a shot of reassurance that it’s all going to be ok. Now is the time you should be playing and enjoying your 5-a-side more than ever. 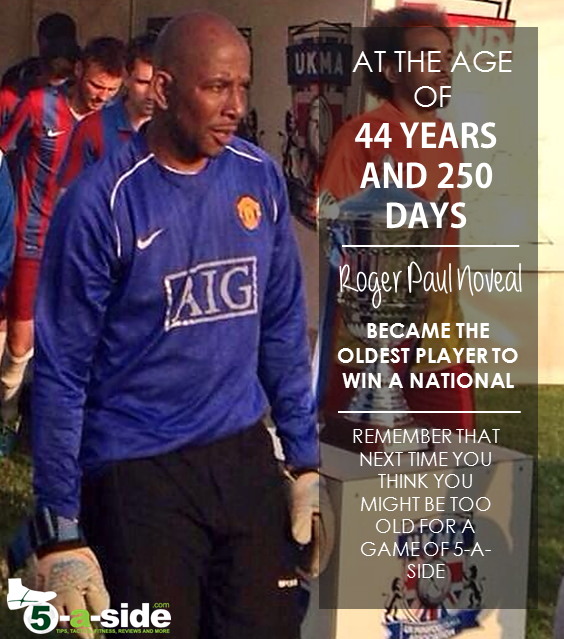 There’s no reason for you to stop playing 5-a-side, just because a little bit (or a lot) of age is catching up with you. In fact, when you consider all the physical and mental benefits that come with playing the game, this is exactly the time you want to be involved, in order to keep yourself in shape. It’s when they’re in their 30s that most people seriously start to confront the issue of getting older. It’s where the doubts creep in and it’s also a decade of your life that is ripe for living out your first real mid-life crisis. So go on, start driving that sports car you always wanted but can’t afford. Grow a ridiculous goatee beard. But for goodness’ sake, don’t give up 5-a-side. There’s no reason why you can’t keep going for a long while yet. Yes, you’re too old if you’re still harbouring some kind of fantasy about playing in the Premier League, but the reality is that ship has sailed. If you’re not in peak physical condition any more – even if you can barely remember what peak physical condition felt like – there really shouldn’t be much to stop you getting back involved in the game. 1. Are you still living and breathing? If you answered yes then congratulations! You can continue playing 5-a-side. Maybe that seems flippant, but that’s how passionate we feel about 5-a-side. There are so many advantages to playing that everyone who possibly can, should do it! And there aren’t many excuses either. Nowadays there’s blind football, wheelchair football, and even ‘walking football’ (some will tell you that’s what I have been playing for years). Your local Football Association should be able to point you in the direction of each of these activities, if you ask them nicely. The sad reason for a lot of the drop-outs are through persistent injury. Things such as that old calf-strain that you just can’t shake. They often lead to a prolonged period of absence from the game you love, which some end up never returning from. Looking after your body should make sure that you can keep on playing through your 30s, 40s, 50s… as long as you damn-well want. When players have problems continuing to play as they get older it’s often because of their reluctance to accept the situation. It can lead to a lot of frustration and disillusionment if you’re still trying to play as if you’re 17. You’ve got to stop charging around like a mad-man, and need to forget the idea of trying to take players on using your no-longer-lightening pace. Instead, expend your energy wisely, learn about positional play and be that wily old fox that you always used to hate playing against. Change, adapt, and embrace that you’re smarter and more experienced than you were then. It’s what plenty of players have done to prolong their careers. Giggs, Ronaldo (the fat one, after his knee injury), Steven Gerrard and more have all done this successfully. An inspirational example, to me, of somebody seeming to get better with age is the guy in the picture below. 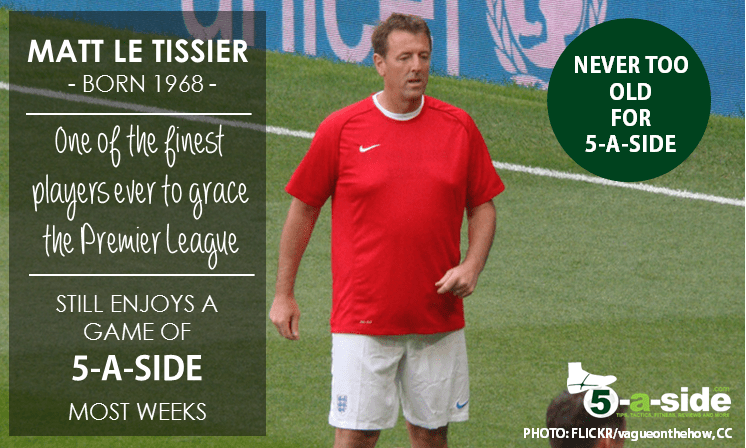 A lot of people on the 5-a-side circuit will know him as ‘The Cat’ – one of the true legends of the game and still one of the best keepers around. Not only is he still in fine condition but he’s built up so much experience that it makes him an incredibly difficult person to play against. Something that helped him become the oldest person to win a national tournament this summer. Nice one Roger! For some, it seems that getting older coincided with a disappearance of the enjoyment factor, and that it might never come back. That often happens when you find yourself feeling as if your game of football has just turned into an exercise in chasing a load of younger men around. That’s nobody’s idea of fun, and in the wrong set of circumstances such behaviour is also likely to land you on some sort of police register. If you are struggling to keep up with much younger players in a very competitive setting then, instead of deciding to just quit football entirely, it’s a much better idea to look to play at a level that’s going to pair you with players of a similar standard. Veterans leagues are more common in the 11-a-side game, but there are places around offering football for those over a certain age. If there isn’t one near you, why not start up your own weekly game for other like-minded, similar age / standard players? You’ll probably find that there are a lot more people also disillusioned with the game, who would love the chance to come back and play 5-a-side again with some decent, like-minded players. Yeah, we know that this post is only going to have been for a small portion of our readership. 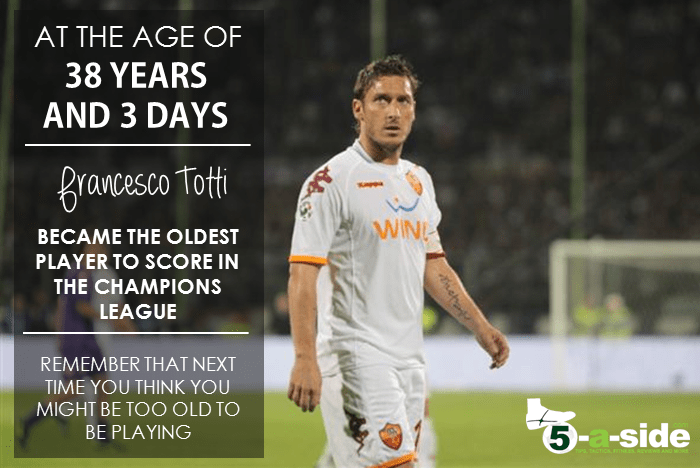 If age isn’t a consideration for you at the moment then may you continue enjoying your football and not take it for granted. For those who are a little more battle-worn, hopefully this has served as a confidence boost to stick with the game you love and to do the things to keep playing it for years and years. If just one person continues to play 5-a-side, or returns back to the game as a result of reading this then that would make our day! 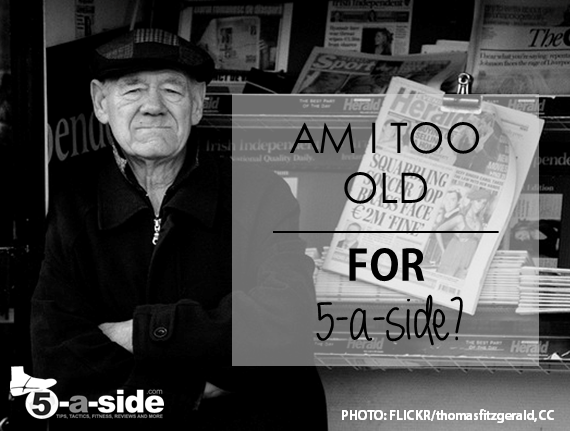 Who is the oldest person you know still playing 5-a-side? Did you stop playing 5-a-side? Are you thinking of quitting? Why? Can you share with the 5-a-side community any tips on how to keep playing and enjoying your football as you get older? Love reading these articles. Started playing again 10 years ago at the age of 40 , once a week and realised once a week was not enough and wanted to find another game. Found a game on a Friday night , fitness levels are quite good. One of the young guys who plays on a Monday night with us said a guy he worked with has an 11 a side team and would we want to play against them. We agreed and we played them on Saturday , we had 3 players over 50 and one player 47 and the rest in late 20s early 30s. It was a great physical game with FA officials , we only lost 3-2 v a bunch of 20 somethings, and we had never played 11 a side together. Age is just a number, but im feeling it a bit today, having to shut out a young wipper snapper half my age running at me for 90 mins. I played at left back in case your wondering. If your thinking of playing again, give it a go and dont give up after the first time, your fitness levels will increase over a couple of months and the aches will not be as bad. Really interesting article and comments. I’m now 43 and played my first 5-a-side with a bunch of 20-somethings a couple of days ago. I’m currently not sports-fit by any stretch of the imagination. I’m not overweight and I don’t drink. I really, really enjoyed it. At one point I got ‘megged by one lad who then spanked it into the top bin and realised that was me 20 years ago. Then I heard their captain saying I was all left foot and that was enough for me – I tore towards him with the ball, shaped to shoot to with my left, chopped it onto my right and swept it home. That was the highlight for me. The over-arching problem is that it is now two days later and I can barely walk up the stairs. Everything aches. Shifting position in my chair aches. Turning to either side aches etc. If I haven’t recovered my ability to move properly in another 2 days I will have to seriously consider playing next week. Yikes! Nothing quite like playing in a game with people half your age to make you feel really old! The first game back is always a nightmare with aching the next day (and several days afterwards too!). But after 6 games or so, you tend to build your fitness to the standard the game needs. Hope you’re settling in to it nicely by now! Gonna be 60 this year, well unfit, can you point me to anything in Brum, mainly around B23- B6 or Sutton Coldfield areas.. i fancy still trying to run a bit more than walking football.. tried walking football and not sure what it was but wasnt feeling it .Regards Antz. Hi Antz, I don’t know the area well enough to point you to what’s out there, I’m afraid. Best thing to do is to get in touch with your local FA and see if they know of any teams in the area. Some veterans teams have 5-a-side sessions which can be a good option. Best of luck mate. Great article; loved your ‘test’ question. Agree it can be done! Just started 6 a side via Footy Addicts app (recommended to find games bye) aged 52, after a 5 year break. Inspired by the prospect of playing with/against my 14 yr old son, who comes too. This is against 20/30 somethings. Have found technique ok (never that great to start with as a central defender), but always shattered the next day. Building in rest/recovery is key. Get a real buzz from scoring the odd goal too!! Hi Guys, I’m 50 in two weeks and just played 5 a side full game tonight outfield for the first time in 8 years. I snapped my knee ACL back then trying to come back to football after years out of it. I went in goal for our team as I tried to recover and got better at it and absolutely love it! I captain the team and am also playing for another local team as I moved house (I stayed in the game!). So tonight was a big deal for me, I came through unscathed and ok with my performance. Played with a guy tonight on our team who is 56 and now my fitness inspiration. I want more! I love reading comments like these! That’s what it’s all about. So glad to hear that you came through unscathed! Really looking forward to you getting back into it and building your fitness again. It’s such a great game! Gents your posts and the article have inspired me. I am 56 and have started a year ago after a twenty year hiatus. I am now rounding people up for a second session during the week. Careful stretching and/or a massage after does mitigate day after aches and pains for old geezers like me and yin yoga once a week helps keep muscles and tendons/ligaments stretched. Onward and upward. Hi Andrew, hope it’s still going well for you. A regular game of 5-a-side is a cracking way to keep fit, as well as to unwind! As you get older, stretching really becomes essential – we’ve learned that the hard way! I think the key to still feeling as if you are contributing on the 5s pitch is to try to adjust your habits away from it. It used to be I didn’t worry about fitness as such as playing 5s always kept me ticking over. Go off on holiday, over indulge, and the first game back may have been a struggle but after that no problem. Now in my mid 40s playing 2/3 times a week it can take a few weeks after getting back before it stops feeling like a total grind. I now try to avoid drink at least the day before playing and find I play better later on in the week the further it is away from the weekend’s excesses. I also cycle to work – around 40 mins round trip each day and have noticed a big improvement in my mobility around the pitch since doing that. I think it is a balance though – I don’t want to live like a monk and still want to enjoy good food and wine but if I do it too much my 5s suffers and I blame it on being too old and think about quitting – until the next game comes along… so I think it is about adapting your lifestyle so that still enjoy life but can still walk off a 5s pitch with a grin on your face rather than a grimace. Nick, there’s some great advice in there. Really agree that it’s about looking after yourself generally. My weekly game of 5-a-side gives me the motivation to do that more than I otherwise would. Pat – love reading comments like this. It’s inspirational to see people keeping on playing the game they love! I’ve just turned 50 and am desperate to set up an over 50s team in or around the Birmingham area. How do we go about this, who are the key people to contact etc? Just had the all clear on my knees so am really looking forward to competing again and I do know the FA peoples cup have tournaments and think it includes over 50s but can find out for sure. Cheers, Gareth. Try getting in touch with your local FA. They should know of lots of options to play locally and should be able to help you find the most suitable session for you. I’m 54 soon to be 55, still playing 2-3 times a week – love playing but starting to realise I’m not as young as I once was – but don’t want to pack in – Help! Does anyone know of any over fiftys five a side, or walking football teams in London, can anyone help? I actually know how you feel mate. I just turned 31 and for about the last 6 month i have been struggling to come to terms with the fact my game has evolved in to the experienced possession is key kind of player. But just recently thought to myself “just embrace it and move on” i can still take players on in tight situations but in a foot race i’ve no chance. I found my game just adapted naturally but i didn’t realise it had at all. Age is just a number. Life makes us feel like we should stop doing the things we enjoy when we get to a certain age because we have responsibilties now. Why?! I have the same responsibilities anyway but no outlet so i become a ball if stress and probably will get fat(ter) and have a heart attack at 50. Forget that. Play for fun and if it isn’t fun anymore thats the time to pack in. Darryl, that’s a great, great comment. I’ve got two years on you, I’m 33, and I noticed a big change in my body over the period since I turned 30. I don’t have great pace to take people on, but then I never had lots of that anyway. I’ve found that it’s about playing smart, the same as you. In fact, I think I have improved a lot of aspects of my game over the period, as I’ve started to think about the game more – where I should be positioning myself, how to make things as easy and effective as possible. I might feel a bit less able, and experience a few more aches, but I fully intend to go on as long as I can walk, which hopefully will be a very long time into the future! It’s vital for my health and wellbeing that I do some sort of exercise, and 5-a-side tops the list every time for me! I am 47 and still playing and our team all over 30′ something won the local five a side tournament in our region two weeks ago! all of the other teams at the tournaments players were young enough to be our kids! it was a thrilling experience to win at our mature ages and was extremely unexpected by most at the tournament. Waynne, thanks for sharing this – it’s yet another inspiring example of how age shouldn’t keep us from enjoying the game we love, and in your case winning games too. Congratulations on the win, that must have been a great feeling to see off all the other teams like that! Ok, I got frustrated with 11 v 11 when I became too old to even try out for the quality of teams that I like to play on. Then I moved exclusively to indoor 6 v 6. After years of that, our group was beginning to split between the old, tactically advanced players and the college-aged, light-footed, recklessly tackling players. We found a solution that has produced some of most consistently rewarding match experiences of our lives. We now rent out a facility and invite the players who are up to par and have the right mindset. Most importantly, we play without referees. Our invitational group now has far fewer injuries and almost never has any matches that get overly heated. Over the years, I’ve been back to normal over-thirty leagues on occasion to fill in for teams that are short on players. I can hardly believe how much playing with these minimum wage referees ruins the game. If you ever get a chance to play with quality players and no referee, I highly recommend it. Great comment Jeff. There are a lot of people who needlessly drop out of the game, disillusioned with it. Yours is an interesting example of sorting out this problem, which I’m sure many more people could benefit from trying. Really interesting point you raise about referees as well – I agree there are some shockers out there but I also think it’s people’s attitude towards them that doesn’t help. I think for some people it gives them license to act like idiots – expecting that the referee is there to sort it all out, rather than taking personal responsibility. That would be an interesting point to debate – maybe one for a future post. Another excellent article and very good timing for me as at the moment I’m the oldest player that I play with! What is more depressing is that I used to be the youngest guy on this team, but after 10 years I’ve seen them all move on and I’ve taken over the ‘Pensioner’ role! My dad carried on playing until his mid-forties before a ACL injury finally called time on his playing. So, if I can beat his record then I’ll feel I’m doing well! Keep up the good work mate and keep those posts coming. Hi Dene, that is funny that you’ve outlasted what sounds like a generation! But I know you’re around my age, so I’m hoping that we have many, many, many years left in us yet. Mid forties is pretty good going for your dad, although what a cruel way for it to end! Hope you’re well mate. Great tips there again. I take omega 3 every now and then but haven’t tried coconut oil rub or tai chi. As for Bagua, I don’t even know how to say it! Maybe a good topic for a future post – other things you can do to fight off aches and pains! Thanks Craig. The notion here is to really understand your physical limits. As you slowly lose that bodily suppleness your technique and approach to the game also needs to evolve to a point where its more about mental attributes than physical. Absolutely! Well said. Adapt or struggle – that seems to be the choice. When I was younger I used to hate playing the older guys, their experience made them so difficult to play against. Was a little worried when I read the title of this but really glad to hear of people playing into their 50s and beyond. It is about mindset at the end of the day. I’m 41 and moved to New Zealand two years ago, having not played football consistently since I was in my late 20s. Joined a five-a-side team in a local league (with five divisions so plenty of scope to find your level) and play every week. Can’t imagine not playing now, absolutely love it. Haha. Hope I didn’t give anyone too much of a scare with the title. That’s a great opportunity, having such a big league programme. Do they play much the same rules as the UK out there – something that might help with a future article. I’m really buzzing that there are so many guys playing beyond their 20s and who are reading and sharing on this site. Thanks for commenting. More than happy to help with info for any future article, just drop me a line. Five-a-side is really popular here. We were talking tonight about entering a local outdoor league as well (it’s spring/summer here now and they run after work). The league I’m playing in at the moment (indoors) actually stipulates you have to have a woman in your team and she has to be on the pitch at all times. At first, a bit chauvinistically, I thought this would make for some poor games and having to back off a bit, etc. Found out the hard way this was not the case, first week going in to tackle a girl a bit casually, got nutmegged, haha. James, thanks for the offer of help. I may well take you up on it. As for the idea of mixed teams, that’s something that has never really seemed to catch on in the UK. That’s a pity, as I think it’s a good idea in certain circumstances. As for getting megged, that’s brilliant – similar happened to me so I know the feeling! Great post I’m 44 next year and still going strong, oldest player we have still going is 60 and he’s amazingly fit for his age ur never too old for a game of fives, we all have our niggles but we had these when we were young as well. What a cracking comment! I just love that there are people playing who are 60. I’m 33 now and going through the frustrations that I’m not so young any more, so hearing that is a real inspiration to me. You’re so right about the niggles. They’ve always been, and always will be around.